Wake up lights are the alarms of the future. They give a lot of great benefits, such as helping you wake up on time with more energy and allowing you to feel better rested after your night of sleep. These alarm clocks are especially helpful for those who have a lot of difficulty getting out of bed as well as those with seasonal affective disorder. The way these alarms work is by simulating the sunrise in your room. By doing this they play off the fact that your body naturally adjusts its sleep cycle when light is introduced into the environment. Even though your eyes are closed, they can still sense the light in the room. As the brightness increases, you will drift into a lighter sleep state. Waking up from deep sleep is stressful and difficult, but if your body is in a lighter stage of sleep, you will automatically wake up more easily and more happily. Out of all the wake up light alarms, which ones are the most popular? Most people like the Philips wake up light alarms. They are the leading brand that produces and sells wake up lights, so it’s a good place to start your search. I’m going to help you get started by talking about how to choose between the different Philips wake up light models, how they are different from each other, and which one is the best (in my opinion). Why Are There More Philips Wake Up Lights Than Other Brands? How easily can you change the settings on the wake up light? Some of these alarms can come with a huge collection of buttons that are difficult to memorize. Others have too few buttons and other inputs, so you may struggle to remember how to adjust a particular setting. You want something that’s simple enough to adjust while still having enough of the features you want. The more features you have, the more adjustments will probably need to be made. Remember that this covers things like the snooze button, setting the alarm time, changing the brightness settings, and other things you will want to do as quickly as possible. If your alarm is too much of a hassle you won’t want to use it! Do you plan to do any traveling? If so, look for a model that’s a bit smaller and more lightweight. Not all wake up lights are shaped well for traveling, as they want to be able to provide optimal lighting in your room. But, there are models which weigh less and are smaller, making them easier to pack. Also consider if there is a battery backup or not. Batteries are a good resource if you’re not sure how the power situation will be during your trip. Some wake up lights have a USB style power cord that can be adapted to fit an outlet. These are perfect for traveling, as you get more options for power sources. Are your eyes sensitive to lights that are too bright? Check to see if you can adjust the brightness settings for the wake up light and by how much. What is more likely to wake you up? Are you particular about the kinds of sounds coming from your alarm clock? Most wake up lights have some number of natural sounds to help ease your wakeup. They may also have a standard alarm beep for those who aren’t going to be woken up by the natural sounds. Others may allow you connect your own device for personal sounds or to use an FM radio. Do you need more than one alarm for the weekends, a partner’s wake up schedule, or anything else? Check if the wake up light you want has this feature. You know your bedside table and your room better than anyone else. How much space do you have to fit a wake up light around your bedroom? While this shouldn’t be the top priority, it’s helpful to look for a Philips wake up light that will fit into your space without too much distuption. Here’s the biggest question about Philips wake up light alarms: Why are there so many, and why are they talked about more often than other brands? Philips discovered the need for wake up lights more quickly than a lot of other companies. They are the first large company to have found the niche and decided to design a product exclusively for this purpose. Wake up light alarms aren’t really a new thing, as they have been around for centuries (http://www.criticalcactus.com/wake-up-light/). However, wake up light alarm clocks are a relatively new concept that’s making a lot of early risers much happier in the mornings. The reason Philips has so many wake up lights is simply because they’ve been doing it longer than a lot of other companies and have released follow-up models after their original models. Once the product caught on a bit, they started designing other styles of wake up lights to see if they could appeal to a broader audience. Popularity of many Philips wake up lights has shown that their tactic worked. A lot of people associate wake up light alarms with Philips as a company. There is a good reason for this though. Philips makes a few good models of wake up lights that fit the needs of a variety of customers. They also offer a variety of prices, so you aren’t forced to buy a piece of junk or an over-priced alarm clock. While this company may not be the best out there at a lot of things, Philips wake up light alarms are pretty good and are worth looking into if you want to buy a wake up light alarm. Remember that there are other brands out there who might serve your needs better, but Philips is great if you’re new to this type of alarm or if you want something that’s well-liked and reliable. You might say that this is the “Cadillac” of Philips wake up light alarms. It is one of the most recently released models and it has many features that aren’t included on earlier versions. 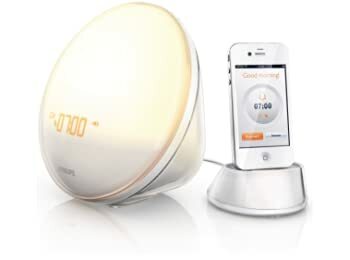 The sunrise simulation on this wake up light is colored to better mimic the actual sun rising. It looks more like natural light instead of just a plain white light. It also has a bedtime sunset simulation that will gradually dim to help you adjust yourself for sleep. Choose between 5 calming wake up sounds from nature, a more traditional alarm sound, or the FM radio to help you wake up all the way. If you need a few more minutes to snooze after the sounds start, tap anywhere on the front light to snooze it for 9 minutes. You can adjust the brightness of the light, up to 300 lux, and also how quickly it turns on. The Philips HF3520 wake up light has pleased a lot of people with its more realistic sunrise coloring and useful features. Being able to set two different alarms is an ability almost exclusively available on this Philips wake up light. This is a plus if you and your partner wake up at different times or if you don’t like resetting your alarm every few days. 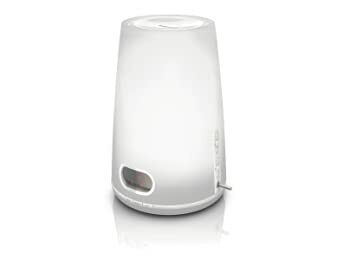 Here is another of the best-selling Philips wake up light models. It is tall and cylindrical in shape, making it a new look compared to the disk or “eyeball” shaped devices. The HF3470 uses a Halogen bulb instead of incandescent or LED bulbs. Halogen bulbs are known to cast a more comfortable and warmer glow than many other types of bulbs. One of the convenient features that sets this wake up light alarm apart is its use of a lever to turn off the alarm mode without shutting off the lamp. You can flick the small lever on the side to turn the alarm function off while leaving the lamp on for your morning routine. The light will automatically shut off after a certain amount of time, so even if you forget to turn it off when you leave it will do so on its own to save power and the bulb. This light will turn on at the lowest brightness setting 30 minutes before your set wake up time and gradually increase the light from there. You can adjust how bright it will be once the alarm is reached. Wake up to one of the 2 nature sounds, a traditional alarm beep, or an FM radio station. Adjust the brightness between 20 settings. 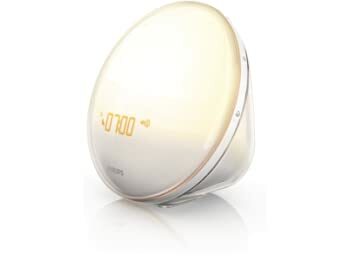 This Philips wake up light is popular because it’s very simple and easy to use. It might not look great to everyone, but it’s functional and effective. The price tag on this wake up light is a bit higher, but it’s a long lasting device with replaceable bulbs. You’ll most likely get a lot of use from it before you ever have to think about buying another alarm. The Philips HF3510 is the earlier version of the HF3520. It’s a reliable wake up light that’s still widely available and used by a lot of people, although it has a few less features than the newer version. This light alarm simulates the sunrise 30 minutes before your set alarm time. It casts a faintly yellow light first that gradually changes to a pure white light once it reaches full brightness. You can be woken up by 3 different natural sound effects, a traditional alarm sound, or your favorite FM radio channel. To catch 9 extra minutes of sleep, but hit the snooze button and wait for the sounds to play again. The light stays on when you hit snooze, so you won’t fall too deeply asleep and wake up grouchier. Help to get your brain into the right state for sleeping by using the sunset simulation. You can use this wake up light as a lamp for light reading or otherwise before it dims enough to make you sleepy. Set the lamp for a dimmer brightness and leave it on if you want to read or relax for a bit longer in the evening. The reason this model remains for sale and is still frequently purchased is that it’s a solid wake up alarm clock. It may not have some of the features the newer HF3520 has, but it’s got everything that most people care about. You can count on this wake up light lasting for a long time without giving you any trouble. Sometimes the simplest option is the best option. 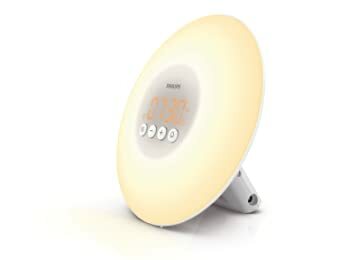 This Philips wake up light is one of the easiest to use out of all the wake up lights on the market, not just Philips products. It sits easily on your bedside table or another surface and won’t fall over. The large orb of LED lights produces the sunrise simulation that will be waking you up. With 10 brightness settings and 30 minutes to reach full brightness, you’ll wake up exactly like you want to once you adjust the settings. The tap-to-snooze function has been included on this wake up light. Instead of looking for a specific button to push, you can tap anywhere on the light and the device will snooze for 9 minutes. Part of the simplicity is that there aren’t many things to adjust. The buttons are all very easy to see and simple to use. It has one natural wake up sound or the traditional alarm beep. 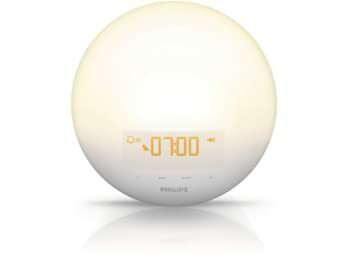 If you’re looking for a very simple option with a lower price point than the other Philips wake up light models, this is the way to go. All of the features on this device are the essentials that will wake you up in a good mood. There aren’t a lot of extra features, but it’s a great device none the less. Shortly after the HF3520 was released, Philips made this model to fit a separate niche group. This has most of the same features of the other model, but includes the ability to work with your iPhone. All you have to do is download the free app and you can make any adjustments you want. Considering that one of the complaints about the HF3520 is the tricky setup controls, this model really improved on that. With your iPhone you can download the app and you will be able to change any of the settings remotely. You can also set up to 10 different alarms and save them. If you don’t want to use sounds from your phone, you can wake up to one of the 8 included sounds. The sunrise simulation is colored just like a real sunrise for an optimal effect. You also get the sunset simulator to help you go to sleep at night more easily. Use the light as a lamp if you want to read or do something else before bed. The biggest appeal of this Philips wake up light alarm is the iPhone app usability. There are some recent reviewers saying that the new iOS updates for later model iPhones do not work with the app anymore, as it was discontinued. If you have an older version of the iOS you can still use the alarm clock well and get the benefits listed above. Make sure to get an adaptor for iPhone 5 and up. Out of all the Philips wake up light clocks I reviewed here, the best one in my opinion is the HF3500. It’s a safe bet for most people, especially if you’ve never tried a wake up light before. Although it doesn’t have a lot of the upgraded features, it’s a simple product that offers you the main benefits of a wake up light: you will wake up with more energy and be in a better state of mind. The HF3500 also wins against all of the other models on price. If you’re someone that appreciates more features and adjustability, try the HF3470. Otherwise, the HF3500 is a great choice for most people looking to get a good wake up light.